I use this game as an aid to encourage English conversation for both children and adults. The students can talk within their team, between teams and with the teacher. It works best with English language proficiency levels of Intermediate (B2) and above. It introduces new vocabulary about islands, the tropics and ships and seafaring. In lower ability classes you can teach them future phrases like “I will search for…” “I want to find…” or “I hope the boat does not sink“. The situation – a shipwrecked survivor – seems to be familiar to all people. Many people know of Robinson Crusoe or the film Castaway. Players seem to like working out survive strategies. It engages students and gets the class to think of imaginative solutions to problems. The game is best if you divide the class into teams of 4 to 6. Each turn a different team member is nominated to be the leader of the team. This person should lead the discussion and will take the decision for the team that turn. Let all the teams discuss their next move. The teacher calls time and invites each leader to write down their “order” for the next turn. At the end of the game, the teacher should invite each team to criticise the choices of the other team and speculate as to who would survive or be rescued. I start the game by drawing a tropical island on the board and asking the class if they can name things they would typically find on such an island. I start by drawing a mountain and palm trees. After the class has exhausted their vocab I start to add things like coconut trees, banana trees, streams of fresh water, coral reefs, wild pigs and goats. 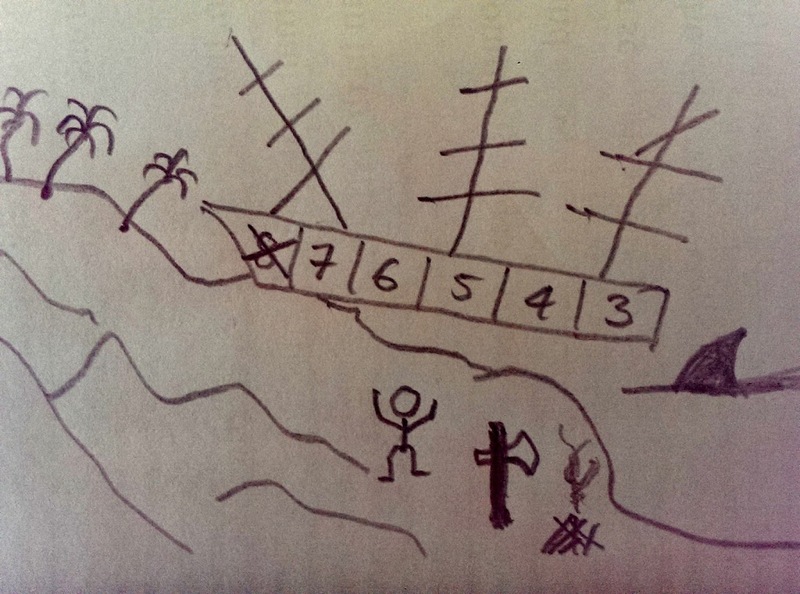 I then draw a sailing ship wrecked on the coast. On the ship I draw “compartments” and I number them from the bow to the stern in descending order, starting at 8 or 7 down to 3. I do not explain these to the players. I tell the class a story. They are on the ship that has been shipwrecked and we are going to play a game called “survival”. 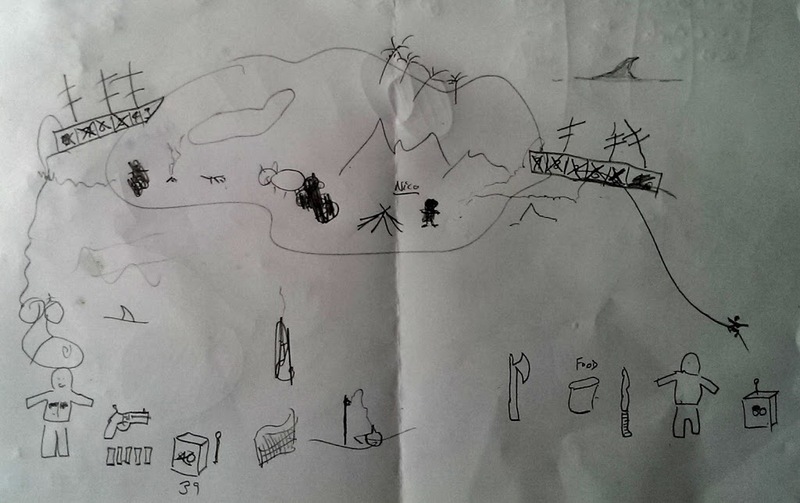 I draw a stick figure on the shore and tell them that they have managed to get off the ship and they are alone and standing their in the pyjamas on the beach, and are wet, tired, thirsty, and hungry. Their ship is stuck on a reef and still afloat though it is taking in water through a hole in the bow of the ship. I tell them that there are things on the ship that they might get that will help them to survive. I divide them into teams. I ask the teams to discuss what item they want from the ship. I ask them to nominate a leader or spokesperson. I do not use any rules for finding the item they require. What I do is to ask the player where they might expect to find the item they are searching for on the ship. I want them to give a rationale, an explanation. Sometimes if they do not give a good enough reason – my judgement – I will let them find a lesser type of object. For example they often saw they want a gun. Unless they tell a good story about why the ship has rifles with lots of ammunition, I let them find a pistol and a few bullets. Every time a player goes back onto the ship they risk making the ship unsteady and it might take on more water and possibly sink. To simulate this I use a simple system called EDNA* (Ever Decreasing Number Allocation). This is a simple disaster modelling system. The target number is the largest uncrossed number in a ship’s compartment. The player rolls two dice. If the sum of the dice is less than the target number then that compartment withstands the sea and does not flood. If the sum is equal or higher than the target number, then that compartment floods. If the sum is higher and a double, then two compartments flood. When all compartments are flooded the ship sinks taking any unwary player down with them. So long as the ship does not sink, the player always manage to collect the item they are searching for. 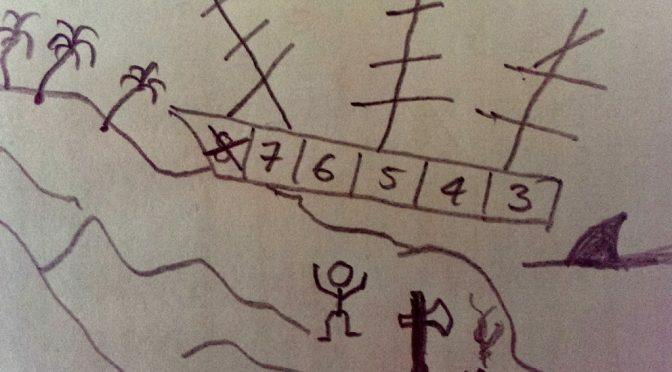 Sometimes if the players are being slow or cannot agree I warn them that the wind is picking up and the waves are tossing the ship about on the water and water is flooding into the ship. If they don’t get the hint, I make the leader roll the dice, and determine if the compartment floods. I do not allow them to collect anything. It rarely comes to this, but it does add to the excitement. Using the image of the ship above as an example. The players have already gone to the ship to retrieve two items, an axe and something to make a fire with. On the last of those forays they have rolled an 8 or more, but not a double 4, 5 or 6, and one compartment in the bow has flooded. The compartment with 8 is now crossed off. If they want to go on the boat to search for something else they will need to roll 2 – 6 to avoid flooding another compartment. On a roll of 7 to 12 one compartment will flood, if the roll is a double 4, 5 or 6, two compartments will flood. Below are two completed games, I played with Max (11) and Nico (8), two Italian boys who have recently started living in England and picking up English. We all took it in turns to draw on the paper. The boys were good, and selected relevant things, like clothes, an axe, tinned food, a knife and matches. But both pushed their luck too far and went back to the nearly flooded ship and sank when the ship was overwhelmed by the sea. This game can easily take an hour to play. It could be done as a quick 15 minute session. You can vary the game duration by telling more elaborate stories or discussing some vocab in more detail. *EDNA was invented by Graham Hockley. I first used it in 1990. It has been incorporated into a some game rules. EDNA is a simple but effective method to model an unpredictable catastrophic event that becomes more likely as time passes. It does not degrade a situation, it models sudden and absolute change from one state into another state. The ship is afloat; the ship is sunk. The volcano is dormant; the volcano is erupting. There is no half-way degraded state. This entry was posted in Games for Education and tagged EnglishTeaching on 22nd January 2015 by Nick.